Cooking for your special love is a most treasured & personal gift you can give. Keep your fine dining clothes clean while creating a masterpiece of the senses for the love of your life. 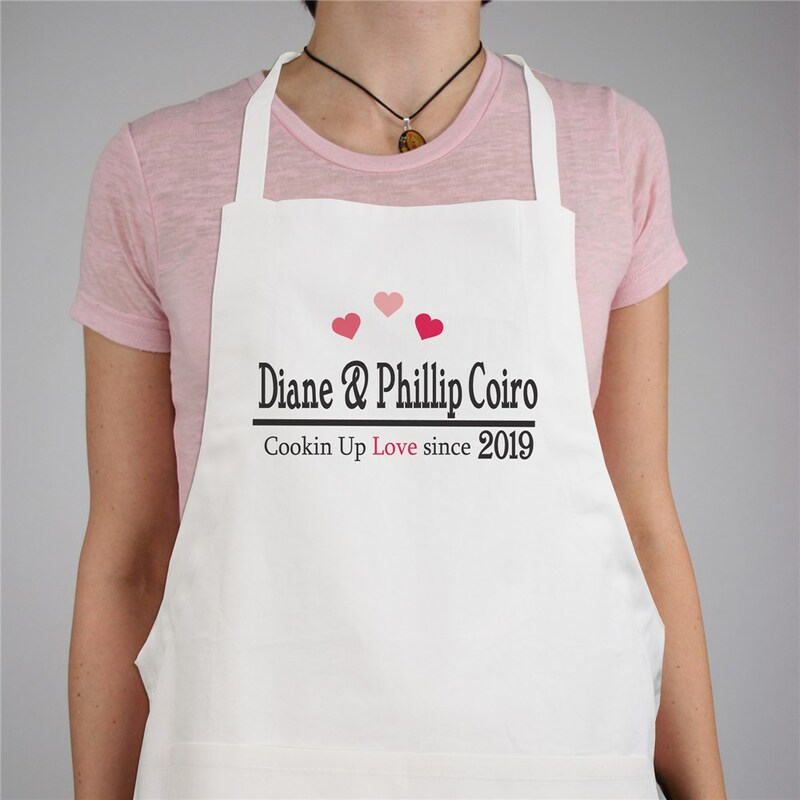 Our Personalized Aprons are more than just a personalized gift for an Anniversary, Sweetest Day or Valentine's Day but for everyday that is for Love. Our Personalized Chef Apron makes for a wonderful way to cook this Valentine's Day for your loved one. This custom bib apron measures 20” Wide x 30” Tall and features multiple pockets for convenient storage along with an adjustable neck strap for a comfortable fit. Includes FREE Personalization! Personalize your Anniversary Apron with any couples names and year. It was a gift and was a big hit with the person that received it! Looks great! I am excited to give it to my friend. What a great idea! Just put a little thought into your gift. Personalize it. Show you care. Our Personalized Aprons are perfect for Valentine's Day, Christmas, Mother's Day, Grandparents Day, Sweetest Day & Birthdays. Create a Custom Printed Apron for someone in your family today. Mom, Nana, Grandma or Granny will love this wonderful apron which you have personalized just for them. When you want to create a thoughtful and romantic gift, GiftsForYouNow.com has a complete selection of Custom & Valentine's Day Gifts from the heart.